Close-ended activities are those that have an end result or a specific objective to achieve. 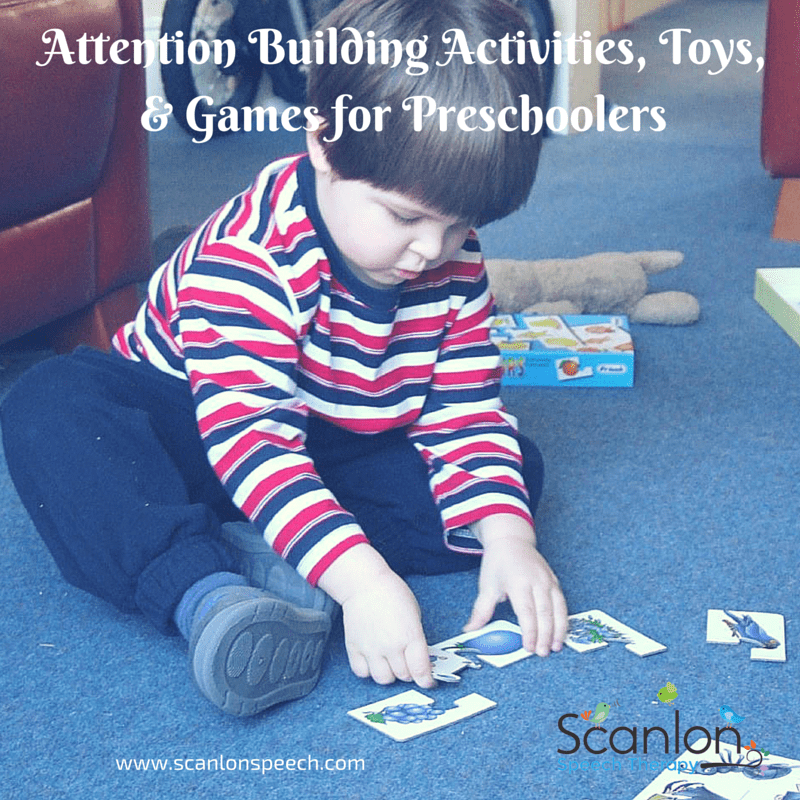 These activities help build attention in young children. To read about the benefits of close-ended activities, click here. Let’s delve in and explore each type. *Amazon Affiliate links are included. Classic example of a close-ended toy. The objective is to complete the puzzle. The child works to complete the puzzle by carefully placing the puzzles in the correct location. 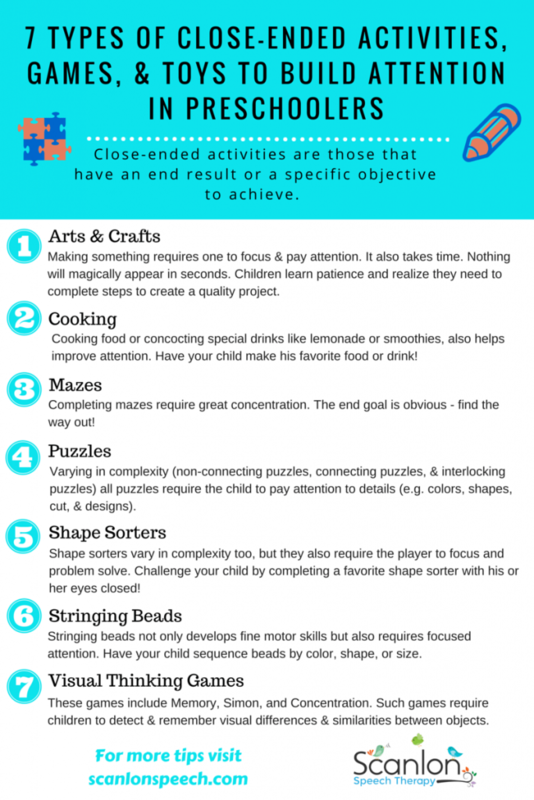 Puzzles vary in complexity, non-connecting puzzles with or without knobs, connecting puzzles, and interlocking puzzles, but all require the child to pay attention to details (e.g. colors, shapes, indentations, and cuts). The child also gains satisfaction and momentum when completing each piece, further increasing attention and wanting to complete the task. This puzzle is simple because there are only three animals. The pieces are chunky and there’s a peg for the child to hold too. This is a step up in complexity because there are more pieces and no pegs. See how it’s getting a bit more complex? This is linear 18 ft floor puzzle will stretch across your floor. I haven’t met a child who hasn’t liked this one. How cool is this puzzle?! This is perfect for the child who is interested in learning about his or her body. Beware – this one is challenging! Tip – Eliminate or reduce all background noise while your child is putting his puzzle together. Making something requires you to focus and pay attention. When doing an arts and crafts activity hand-eye coordination is required. And for younger children who are still developing their fine motor control, focus is needed. Also, creating something takes time. It’s not going to magically appear in seconds (unlike some tablet technology). This helps to teach children to delay immediate gratification. Children learn patience and realize that they need to complete steps to finish a quality project. Tip – Have a finished sample of the arts and crafts activity that you intend to have your child complete. The visual will guide him in achieving the end result. Here are some of my favorites visual thinking games. Tip: These games require more than one participant. When playing with your child, show him that YOU are focusing and paying attention when playing the game. Even say aloud, “I need to look very carefully at the ______ or, I’m being very quiet and paying attention to ________. Having your child hear your thoughts will help him to create an internal dialogue that will help him to focus and problem solve. To read more about how close-ended activities help develop attention in children, particularly those with autism, click here. Completing mazes require great concentration and the goal is obvious – find the way out. Paper and pencil mazes. Here’s a link to printable mazes from education.com. Tip: For new maze players, show or highlight the starting point as well as the end or exit. The child will have to figure out how to navigate the maze. Shape sorters vary in complexity, but they all require the player to pay attention, focus, and problem solve. This shape sorter is fairly easy because it only has three holes with three corresponding shapes. This shape sorter is more difficult because there are more shapes to fit into the corresponding holes. The shaped cutouts are also more complex, making it harder to match up and fit into the holes. This is a popular shape sorter that I bought for my own daughter because she likes shape sorters. However, I’m a little disappointed because unlike traditional shape sorters, it’s easy for the child to fit any animal into the holes by putting them in sideways. This defeats the whole purpose of the task. Tip – Once your child has mastered one shape sorter, shake things up by encouraging him to close his eyes while trying to fit in the pieces. Take turns and try it yourself too! When you make a meal or even something to drink, you’re creating something specific, thereby having a targeted end-result. I wrote a guest post for Jennifer Hatfield from Therapy and Learning Services on WHY we should let our children play with food and HOW making food and (even drinks like fresh squeezed lemonade) can develop language. Cooking food and concocting special drinks like lemonade or smoothies, also helps in improving attention. Tip: Have your child participate in making one or his favorite meals. Motivation increases attention! Allow him to make a portion of the meal. Such tasks are purposeful, tactile, educational and fun. Stringing beads not only develops fine motor skills but also requires focused attention. Tip: Have your child copy patterns with colored beads or even different types of pasta. Your child can sequence by color, size, shape, or texture. Encourage your child to sort the beads or pasta by category, thereby making the task more efficient. To really build your child’s attention, reduce the amount of toys that are readily available. More toys at his disposable may increase distractibility and reduce task completion. Children attend for a longer time when they only have access to one or two toys or activities at a time. Give a choice and then let him finish the activity before moving on to the next one.